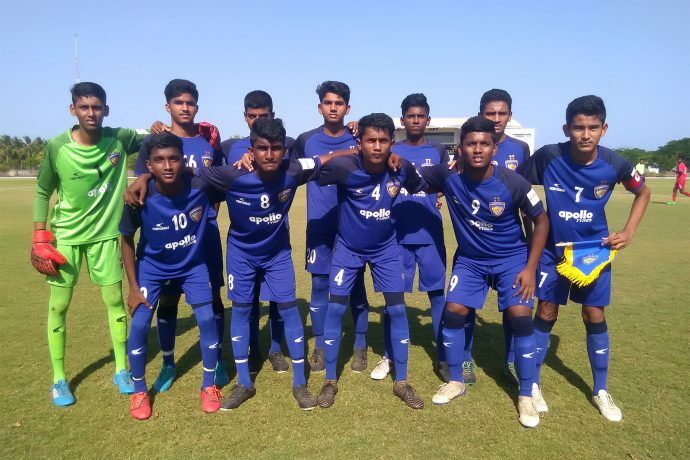 The Chennaiyin FC Under-15 team secured their first win of the 2018-19 Hero Junior League season with a 4-0 win over Raman Vijayan Soccer School U-15s at the SSN College Ground in Chennai today. Mohamed Liyaakath starred with a hat-trick as S. Yugan scored the other CFC goal. Liyaakath has been called up to the U-16 national team camp commencing tomorrow in Goa. He is the only player from Tamil Nadu to be called up to the camp, having already featured for the India U-16s during their exposure trip to UAE earlier in January this year. Liyaakath has been promoted to the CFC U-15 squad after impressing with 23 goals for the CFC U-13s in last year’s Hero U-13 Youth League. The CFC U-15s will face the FC Madras U-15s in their next outing on Monday April 15, 2019 at the SSN College Ground. Liyaakath was one of the three changes made by CFC to the side that lost 1-0 in their opening game against Great Goals U-15s. Taufiq Ahamed and Kishore R.A. also came into the starting eleven as Caron Kennedy, Manoj J. And K. Suriya made way. CFC got off to the best possible start, earning a penalty kick in the opening minute after Rahul Manjula was fouled in the RVSS box. Up stepped Liyaakath, making no mistake from the spot to give his side the lead. And it soon became 2-0 to CFC, with Rahul again instrumental for the hosts. After a confident dribble into opposition territory, his shot was saved by the RVSS keeper, only for Yugan to score from the rebound. With the half hour mark approaching, Liyaakath added his second of the afternoon. He got on the end of an inviting cross by Sathish Kumar from the right flank, heading it past the RVSS keeper to make it 3-0. RVSS had a rare chance before half-time, a shot from distance by Solaimalai R. going just wide of the post after a flowing move. CFC made changes in the second period, one of them being K. Suriya, who had notched 21 goals alongside Liyaakath in the last season’s Hero U-13 Youth League. Suriya along with Liyaakath continued to create chances but were wasteful in front of goal. The fourth goal, and Liyaakath’s hat-trick strike eventually came in the 77th minute. It was a solo strike by the CFC attacker, carrying the ball over forty yards before finding the back of the net.